One of the exciting new features of iOS 9 is the ability to block advertising on the internet. Personally, I hate it when I’m trying to read an article and keep getting inturrupted with annoying ads poping up everywhere. Well, now Apple has made it possible to completely eliminate these distractions. It’s a new feature in Safari called Content Blockers. Now, iOS 9 alone does not have the ability to block ads, but instead allows for ad-blocking apps to work within Safari to hide unwanted clutter. There have been a number of apps already released that can successfully block ads within Safari and other apps that use Safari as their in-app browser. But there are a couple that stand out above the crowd. The first one is Purify Blocker. Purify offers a simple interface, but sports some pretty nice capabilities. For one, it uses a curated database which blocks harmful content too, as ads also help advertisers track your internet activity. This database is updated regularly outside of the app so that it will always be able to keep up with the latest advertising schemes. Another neat feature of Purify is its app extensions (read about app extensions here). Through the iOS share menu, Purify will allow you to whitelist the current page your reading. That means you’ll allow ads on that site until you say not to. This is a great feature that allows you to continue supporting your favorite websites, like AppChasers, that depend on advertising to stay afloat. Another content blocking app that’s stands out above the the crowd is 1Blocker. It’s a free alternative for those looking for a cheaper, but still nice, alternative to Purify Blocker. It will successfully root out the unwanted ads on any site you’re browsing in Safari. It’s so simple that there is only one toggle to turn it on. If you’d like to enable more features, there are several additional blocking categories available as an in-app purchase. These include blocking trackers, widgets, custom fonts, adult sites, and page comments. 1Blocker is a great way to experiement with content blocking and see if it’s for you. In order to turn on content blocking, you first need to download one of the apps mentioned above. Then head over to your Settings app. 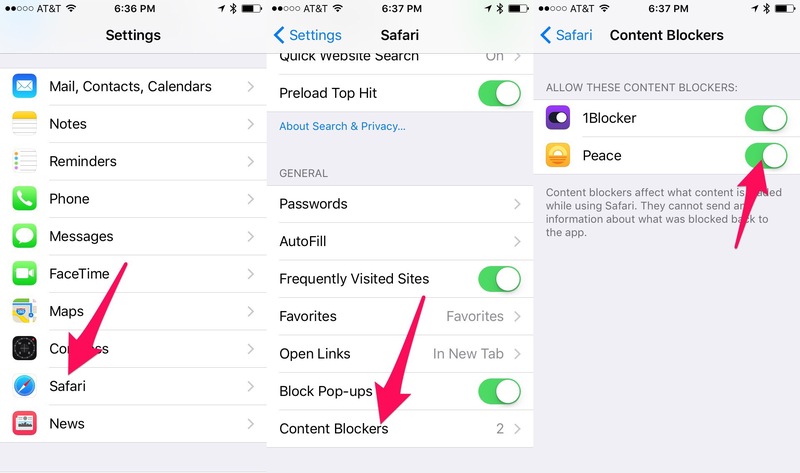 The following path with allow you to turn on those apps: Settings -> Safari -> Content Blockers. Now you’ll never need to relaunch those apps if you don’t want to. You don’t even need to keep them running in the background. All the work is accomplished through Safari. Follow these steps to enable content blockers. Now you might be wondering, if AppChasers is funded by displaying ads, why are we promoting ad blocking? Because we feel its the best way for our readers to experience the web. We are confident that if you enjoy our content, you’ll choose to support us in other ways. These include shopping Amazon through our affiliate link here, or giving us a tip here. You might also be interested in our new T-shirt, which is available here. Regardless of whether you choose to show your support or not, we want you to know about the best apps for your iPhone and iPad. Enjoy. Do You know a way too down load wt. library n a mac pro pc?